This set of photographs was taken about a month ago at Pure Studio, Preston. My first time there, but I liked the studio space and setup so much that I’ve since booked it again for more photoshoots. The studio occupies two upper floors of an old mill building. On a good day there is lots of natural light streaming in through large windows, though I’m usually more at home using studio flash. The studio has a supply of Elinchrom flash-heads, with a range of modifiers. The studio owner, Simon, is on-hand to give help if needed, though I’m quite at home in a studio so had no trouble setting up the lighting, and Simon was happy to leave me to it. As well as my first visit to Pure Preston, this was my first time photographing professional model Mischkah Scott. She was an absolute pleasure to work with, very artistic and creative. I hope to work with her again soon. 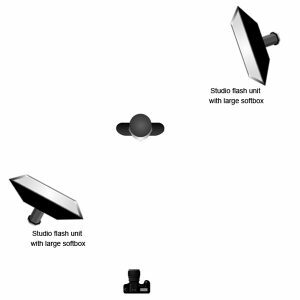 These images were shot towards the middle of the studio, using one of the supports as a prop. I setup basic two-point lighting, with a softbox behind Mischkah and another softbox in front to add some fill. I used a 70-200 f/2.8 lens wide open from several feet away. Click the images to see them larger and please feel free to leave a comment or question. Thanks for reading. Hi Paul, your set up is the first time I’ve seen the key light behind the model, with a fill light at the front, giving very slight low-key effect, and I like this effect quite a lot, especially with the skin tones of this particular model. What height were the large soft boxes set at? Re the model herself, she has some wonderful curvy poses (did she choose those poses, or did you? ), and I particularly like number 6 where she is looking down at the floor. All in all, you must be very pleased with the results from this shoot. Thank you for your very astute comments yet again. Very much appreciated. Yes, I purposely wanted a lot of light coming from behind Mischkah. The softboxes were positioned no higher than normal, to try to light most of her from head to toe. It’s a bit of a cliche, but Mischkah needed very little direction, so the posing was a collaboration of her doing her thing and me guiding her. I think the last two images are my favourites, hence me posting them on their own.